Yum doesn’t mean bad fat and sugar. It means flavor. In a meal or a drink. I get mine from King Arthur Flour, Double Dutch Dark Cocoa. YUM! I insist that you use quality cocoa in this recipe. If you use Hershey's or something less than awesome like that, don't email me and ask me why your cocoa wasn't amazing. Sift your cocoa, espresso powder, vanilla powder, and salt. In a medium sauce pan whisk together your dry ingredients with soymilk, agave nectar, and vanilla extract until blended. Heat ingredients together over medium to medium high heat until hot. Top with favorite marshmallows or meringue. Serves 4. 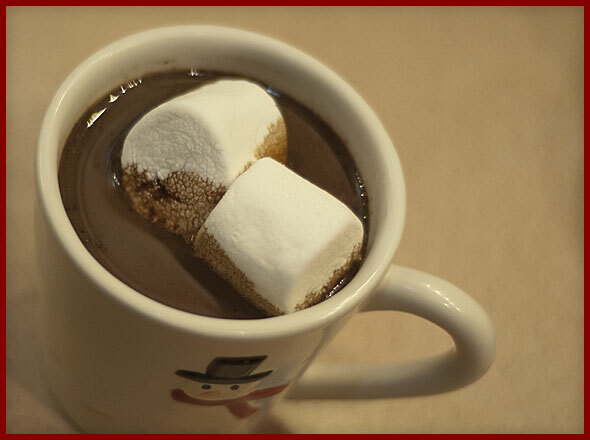 *I prefer my cocoa less sweet because I love chocolate, but some people like it topped with something sweet, like marshmallows. If you aren't topping your cocoa with anything sweet, you may want to increase the agave nectar or maple syrup in the recipe to 1/3 cup. I'd start with the smaller amount, taste it as it's heating, increase agave if you want it sweeter. I’m trying this tomorrow morning AND….I found that if I blend any cocoa or pumpkin spice or soy/milk-based drink it creates an awesome “natural” froth! And I thoroughly enjoy a good froth. Thanks for the great recipe! GREAT tip MB! How was it??? Only a few things hit the spot like delicious cocoa and this definitely hit the spot!! Thanks Nourishment!